Bennington Furniture is proud to design and manufacture its timeless, elegant furniture from its workshops in Nottinghamshire Launched in 2000, Bennington Furniture is sister company to Bennington Carriages which holds a Royal Warrant from HRH The Duke of Edinburgh. Sharing the same workshops, the passion and craftsmanship used to create Bennington’s carriages is also used to create beautiful metal furniture for the home and garden. Our team of skilled craftsmen and women use their experience of modern design, metalwork and upholstery to create elegant furniture that is beautiful, practical, timeless and durable. We use the finest materials from the coatings on the metal frames to luxury upholstery fabrics to create bespoke pieces, handmade to order and tailored to your specific requirements. We have a range of designs from traditional to contemporary for every room in your house including the garden. No request is too small – or too complex. If you need a dining table to seat six or sixteen we can adjust a design to do that. 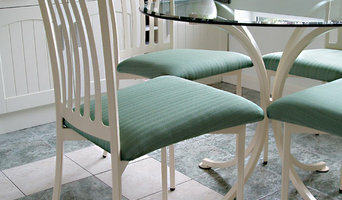 If you want to stretch a sofa or make it into an armchair we can do that too. You choose the design, you choose the colour and finish (from a range of nine colours) and you choose your fabrics to create furniture that is unique to you and your home. Come and visit us at the showroom to experience for yourself the love and craftsmanship that goes into every piece of Bennington Metal Furniture. Call us on 01400 281280 to book an appointment. We very much look forward to meeting you. Why should I hire a Nottingham, Nottinghamshire blacksmith or metal worker? If you dream of elaborate iron gates and railings surrounding your property, or a beautiful Juliet balcony or outdoor iron balustrades, then it’s essential to hire wrought iron workers that can create and install these beautiful structures professionally. If you want to save a little and not go for hand-crafted, blacksmith-made pieces, you’ll still be able to find Nottingham, Nottinghamshire metal fabricators that create railings and gates in bulk in a number of styles that will fit with your house design. Feel your garden is lacking that je ne sais quoi? Metal sculpture artists specialise in unique metal art that is suitable for outdoor conditions and can liven up an empty garden area. Metal workers can also work wonders with old scrap metal such as iron radiators or old iron railings, and turn them into ornamental pieces for decoration or even new pieces of furniture. Talk to an ironwork professional or blacksmith in Nottingham, Nottinghamshire from Houzz to see what wrought iron work or metal pieces they can create or install in your home. Here are some related professionals and vendors to complement the work of wrought iron workers: Fencing & Gates, Decks, Patios, Sheds & Summerhouses, Cladding & Exterior Contractors. Questions to ask a Nottingham, Nottinghamshire blacksmith or metal worker? How long have you been in the metal work business? Do you handmake your metalwork or fabricate metal structures in bulk? Do you create large wrought iron work like iron gates or usually work on smaller pieces? Do you have any official metal worker qualifications? Can you provide me with references from previous clients? When can you complete this job? Do you have any advice for aftercare – how should I maintain my ironwork? Will the ironwork weather in the elements? Will you repair my metalwork if necessary? Find an ironworker or blacksmith on Houzz. Narrow your search in the Professionals section of the website to Nottingham, Nottinghamshire blacksmiths and ironworkers. You can also look through Nottingham, Nottinghamshire photos to find examples of ironwork that you like, such as iron gates or railings, then contact the metal worker who fabricated them.